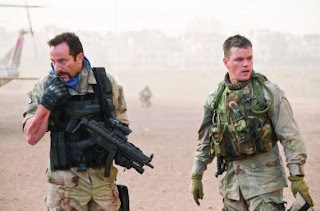 The topical political thriller has become an exceedingly difficult genre to mine commercial success from as of late, as evidenced by the battleground of smoking cinematic crater-holes left by Hollywood’s more costly attempts to weave smart adult entertainment out of the tangled mess of threads that makes up the current conflict in the Middle East. Mega-names such Cruise, Hanks, DiCaprio, Crowe, Clooney and Foxx have all valiantly tried to pull off this tricky endeavour and been treated to mixed critical response and anaemic box-office returns. 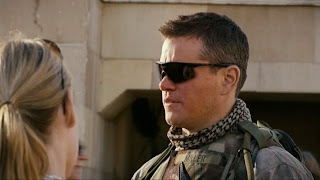 Even Best Picture Oscar-winner The Hurt Locker, almost unanimously praised for its gritty authenticity and skilful use of ticking time-bomb tension (Literally! ), only managed to eke out an unimpressive $15-million-dollars during its entire North American run. Ultimately, this long string of failures seems to prove, quite concretely, that audiences simply aren’t yet willing to spend their recreational time supporting films which mirror the disheartening political climate that’s coloured their day-to-day life. Quelle surprise! 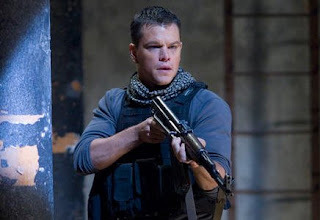 Now we have Green Zone, an occasionally efficient, but largely flavourless, quasi-adaptation of Rajiv Chandrasekaran’s factual account Imperial Life in the Emerald City, directed by maverick Bourne Supremacy and Ultimatum auteur Paul Greengrass, and starring Bourne himself, Mr. Matt Damon. Playing Chief Warrant Officer Roy Miller, a dedicated G.I. trying to sniff out WMDs in war-torn Baghdad, the reliable actor is in full-on action-star mode; stoic, remote and all-business, a hard-edged professional seeking to expose the truth amidst a veritable maelstrom of bad intel, administrative power struggles and bureaucratic double-talk. After his latest futile assignment leads to a deserted toilet factory, he teams with Marty Brown (Brendan Gleeson), an unconventional CIA agent who questions the dependability of the government’s top-secret insider source, nick-named “Magellan”. Going rogue, dogged at every turn by both smarmy Pentagon intelligence officer Clark Poundstone (Greg Kinnear) and intrepid Wall Street Journal reporter Lawrie Dayne (Amy Ryan), Miller sets his sights on capturing the elusive Al-Rawi (Igal Naor) – a resourceful Iraqi General who may provide the elusive answers he requires. As he proved in his two Bourne instalments and, more impressively, the extraordinary United 93, Greengrass knows how to construct an immersive sense of place through his apprehensive cinéma vérité-style of filmmaking, capturing the unfolding happenings around him with a documentarian’s zeal and a brilliant eye for raw, powerful visuals. Perhaps better than any previous effort, he flawlessly replicates the urban chaos of Baghdad, where the streets almost explode with frenzied swarms of confused pedestrians. Although his action set-pieces here are a tad too muddled and grimy to be particularly riveting, there’s a genuine urgency and ugly magnificence to the director’s trademark style (one striking scene, depicting a fiery helicopter crash, is an astonishing illustration of isolated pandemonium) which goes a long way towards energizing Brian Helgeland’s flat script. Due to the audience’s own acquaintance with recent history, we're aware Miller isn’t destined to unearth any WMDs looong before he gets with the program - which wo uld be fine if Green Zone was involving on an emotional level. Unfortunately, however, the film is thick with scarcely two-dimensional, personality-deficient characters that alternate between delivering weary polemics and rigid exposition. Amy Ryan - unforgettable as a white-trash mom in Gone Baby Gone - is criminally under-utilized; a walking plot device, whose sole thankless job is giving Damon and Kinnear someone to bounce their inner-thoughts off of. 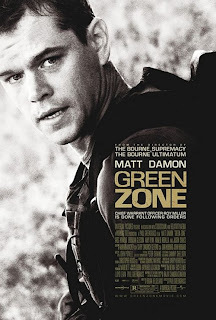 Unlike The Hurt Locker, which used realistically nuanced and believable characters to draw us into the intense drama, Green Zone hangs itself squarely on the broad shoulders of Damon’s Miller, who is an utter cipher. The actor has the phys icality of the role down, and is wholly convincing as a highly-trained soldier, but how can we become invested in his story, or significant impact upon the larger picture, when there’s nothing to hold onto? He’s the definitive Teflon hero. There’s an intriguing side-player, Freddy (Khalid Abdalla), a crippled informer with a history of violence, who gets unwittingly pulled into Miller’s mission, who’d have made a far more relatable and fascinating protagonist. He could have steered the narrative in a fresher direction, allowing us an outsider’s perspective on the perplexities of the highly-volatile situation. Alas, Helgeland and Greengrass were either oblivious to this notion, or completely uninterested, and their movie suffers for it. While I can admire and support the filmmakers’ desires to use a relatively standard genre framework to express their own deeply-felt political beliefs, their final product too often feels like it’s preaching to the converted; conveying now-routine messages to ticket-buyers who’ve already seen them explored more sophisticatedly in better pictures. No, at the end of the day, Green Zone works better as a technical exercise, demonstrating Greengrass’ virtuoso-like ability to energize even listless material through sheer kinetic movie-making wizardry. Faint praise, I realize, but uncovering a minor victory is still preferable to coming out of the theatre empty-handed. *Originally printed in SFU's The Peak: March 22nd, 2010.